The new Michelangelo® Hand from Ottobock is the only prosthetic hand with seven functional options, including a moveable thumb, allowing the user to pick up objects sideways, grip flat items from the side, carry cylindrical objects with a large diameter, and hold small objects securely using the thumb, middle finger, and index finger to form a three-point support. "I can lift things, I can hold things, I can change the hand position, I can do any number of things. This is by far the most anatomically-correct hand I've ever had." - Michael Nelson, first Sampson's patients to wear the Michelangelo, fit by Bill Sampson, CP. "While the science of prosthetics has advanced leaps and bounds over the past 15-plus years with microprocessor technology, today there is a revolutionary prosthetic hand, so new, so lifelike, and so sophisticated that only a few people in the country have it. One of these fortunate individuals is a patient of Bill Sampson, CP, president of Sampson's Prosthetic & Orthotic Laboratory, with offices in the Capital Region including Albany and Schenectady. Bill's patient, Michael Nelson, a native of Clifton Park who now resides in Pittsfield, Mass., has been wearing the new Michelangelo® hand from manufacturer Ottobock for about a month. The Michelangelo hand is the only hand with seven functional options - allowing the user to hold objects between the fingertips, carry an object with an open palm, pick up objects sideways, grip flat items from the side, carry cylindrical objects with a large diameter, and hold small objects securely using the thumb, middle finger and index finger to form a three-point support. That is a significant gain in functionality and a major advantage compared to other systems available today. 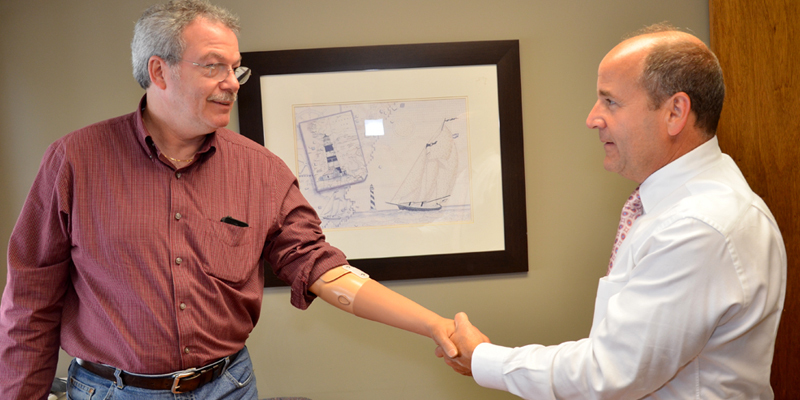 "This hand offers innovative, never-before-seen gripping kinematics," Bill Sampson said. "It's equipped with two drive units giving the thumb, index finger, and middle finger unprecedented control, speed, and function." "I can lift things, I can hold things, I can change the hand position, I can do any number of things," Nelson said. "What makes it remarkable is programming the hand through Bluetooth and setting the hand for multiple functions. It takes me just seconds to change the grip." Amazingly, the hand does not look "bionic." 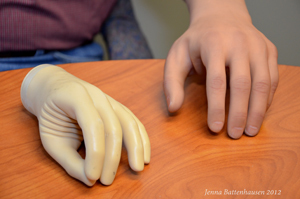 Lifelike and natural looking, the fingers are made of both hard soft materials that mirror bones, joints, muscles, and tendons. "This is by far, the most anatomically correct hand I've ever had," Nelson said. "The skin product is very realistic looking, and the design mimics the contour of the hand. "I'm very pleased with the design and functionality of the hand. It's quite a step up from the rest of the pack," he said. Nelson has been an amputee since 1979, when as a police officer in Dauphin County, Pa., he was shot on the job. The injuries left him with a fused elbow and the loss of his hand. He has logged 34 years of public service including the military and serving as the assistant director of the New York State Division of the Lottery. Nelson has 34 years of public service including the military and as an employee of the New York state lottery. He retired in 2010, and joined a BMW dealership as a sales representative.